Looks like some people are exposing OSGi on Lotus Domino servers. 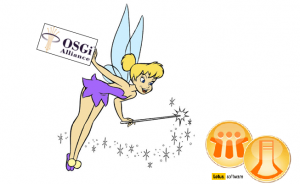 I especially like the part when they mention the benefits of extensibility, easy deployment and leveraging existing OSGi assets. Oh, the mention that they get “better tooling with Eclipse IDE and its first class Java and plugins editors and Java debugger” is a nice touch too. In all seriousness, the more OSGi gets exposed in the significantly large Lotus ecosystem the better. Next Post →The Death of the Floppy Save Icon?